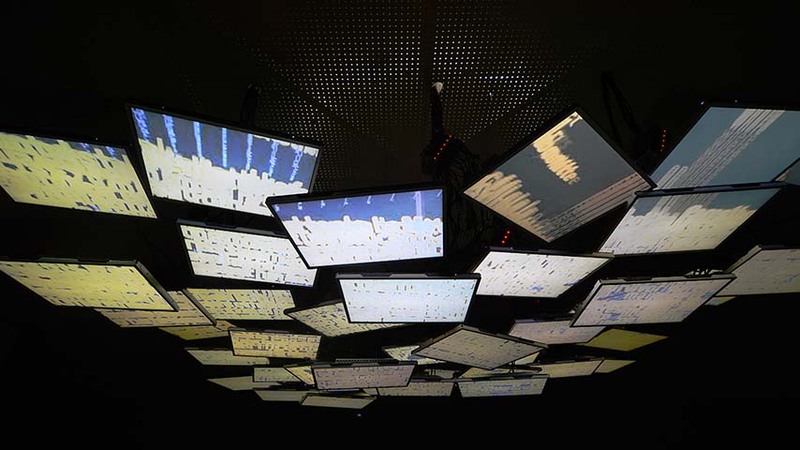 Array is an interactive audio & video installation made up of LCD monitors hanging from the gallery ceiling and facing downward. The imagery evolves based on input from light and movement within the space. Below the monitors is a viewing area with movable seating where viewers are invited to sit down, lay back and experience the installation. Sound waves based on the 432 Hz frequency scale reverberate through the space. Text displayed on the screens represents all the most popular stories taken from the New York Times newsfeed throughout the day. Throughout human history, we have looked up in order to observe, catalogue, map coordinates, install communication networks, and mine information. Array aims to create a dialogue around this act of looking up, observation, navigation, mapping patterns and information networks.